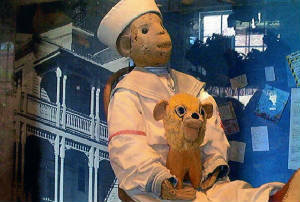 Robert The Doll for over a hundred years has been blamed for every type of misconduct. There are so many theories about why Robert behaves the way he does. Some say its voodoo. 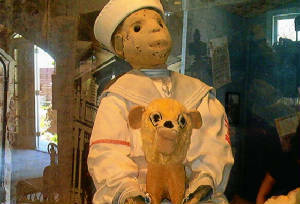 some say that it is an ancient curse, still others insist that Gene Otto's ghost has returned to the doll he loved so much. 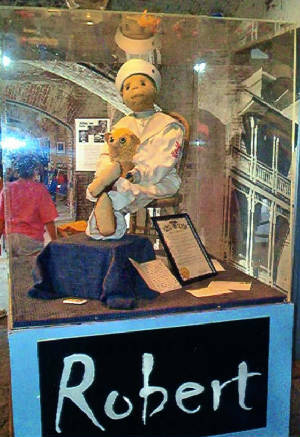 In 1903, Robert was given to then four year old Gene Otto by a girl who's mother was thought to have placed a voodoo curse on the doll. When he was at the artist house (Gene Otto's home ) kids would say they seen him moving in the upstairs window. When at the museum, make sure to ask Robert to take his picture, you might find that your camera wont work as I did when I didnt ask to take his picture.I had a 7.1 mp kodak digital camera that refused to work, even though I had fresh batteries in it. It would not take the picture. I then said excuse me Robert can I take your picture and my camera worked fine. I took these 3 pictures with no problems. My husband who made fun of Robert while we was at the museum, sticking his tongue out at him and making faces at him wasn't so fortunate.The next day and the rest of the week was bad for my hubby.